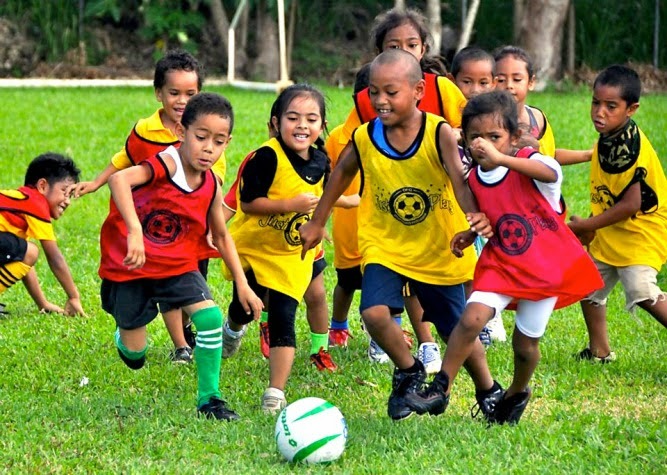 Pacific Island Countries: How does a ball help change the lives of children? It all starts with a ball. But when you add an inspiring coach and a safe place to play, the power of sport takes root. Children are naturally drawn to sport, recreation and play, which are a vital part of childhood. Not only are they a vital part of helping children to grow, learn and explore, they are every child’s right. As outlined in the Convention on the Rights of the Child, which is celebrating its 25th anniversary on November 20th, 2014, every child has the right to leisure, recreation and cultural activities. Children are affected by high levels of violence at home and in school. Understanding that every child has the right to play, in 2009 the Just Play programme began, as a joint initiative between the Oceanic Football Confederation, the Australian Government (Australian Aid and Australian Sports Commission), the Football Federation of Australia, the Union of European Football Association and UNICEF Pacific. As greater numbers of children in the Pacific Island countries are increasingly affected by poverty, violence, abuse and non-communicable diseases, Just Play is a critical entry point through which to engage, empower and mobilize children in a positive, practical and fun manner. Children who have a positive experience in physical activity early on in life are more likely to develop good exercise habits and to participate in sport and physical activity throughout their lives. Through this active participation model, Just Play gives children the knowledge and skills to develop healthy lifestyle habits and become confident in their abilities; encourages gender equality; promotes social inclusion and; insists on sport for all. With the help of a football, the Just Play programme has engaged over 150,000 children, 44% of which are girls, in 11 Pacific Island countries, to grow, learn and explore through sport. Similarly, with just a ball, sport programs around the world reach out to millions of children each and every day. That one ball, teaches them about teamwork and fair play. It helps girls and boys play together, and promotes the importance of physical activity and exercise. With the help of this one football, UNICEF and the Oceania Football Confederation are using the Just Play program to teach children to develop healthy lifestyle habits, encourage gender equality, promote inclusion of children with disabilities and become active community citizens. This one ball, the Just Play football, is helping children in the Pacific Islands to more effectively navigate the many challenges which affect their daily lives. This one Just Play football is making a difference, transforming the lives of children in the Pacific every day. Did you ever think that one ball could be so powerful? I now pass the ball on to you. Sport makes a difference and with your ball, you can too! 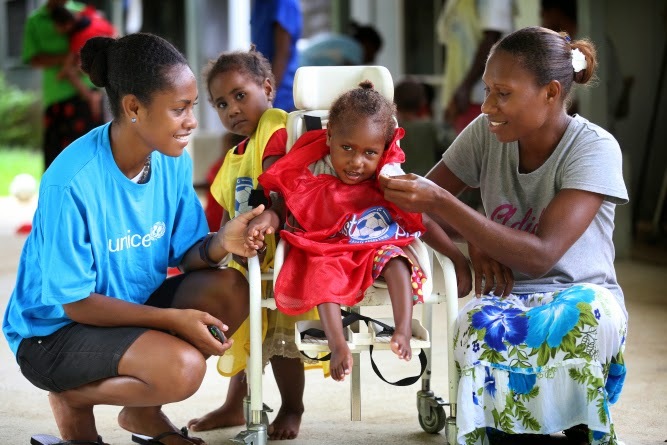 Melissa Palombi is a Sport for Development Consultant working with UNICEF Pacific.